From the Digital Marketing Team at Macmillan, who rock. I have been thinking about the new, proposed OCLC Policy, scheduled to take effect in mid-February. I was driven to act after a recent AUTOCAT posting, in which a librarian suggested libraries not expose their collections to the web, except for “original cataloging,” for fear of the new OCLC Policy. How terrible would that be? I’m not sure the specific fear is justified, but fear certainly is. As the Policy states, violations of the OCLC Policy “automatically” terminate a libraries right to use any OCLC records. And OCLC gets to say what constitutes a violation. It got me thinking about compiling all the arguments against the Policy. I want to start with the process and legal ones, which have gotten very short shrift. OCLC spokespeople are persuasive personalities, and OCLC’s “Frequently Asked Questions” allay fears, but the Policy itself is a scary piece of legal writing and, as it explictly asserts, the only writing that matters. 1. The Policy fundamentally changes the character of OCLC, a “member” institution, with no formal member approval and with little member input. WorldCat is why OCLC was created, is OCLC’s largest revenue source, the basis of most of their other services and the most common way OCLC interacts with its members. The Policy transforms WorldCat in many respects, but most of all in how OCLC relates legally to its members from a cooperative to a sort of licensure. OCLC is supposed to be a member organization. But what member organization would fundamentally alter its core business and transform their relationship with members without putting the issue squarely before them? Yet OCLC has done just that. 2. The Policy is a legal document. No other statements matter. The policy is a legal document, not a statement of intent or aspirations. It explicitly states (§E7) that it is “the final, complete and exclusive statement of the agreement of the partiwith respect to the subject matter hereof.” That means that the “intent” of the Policy as voiced by OCLC spokespeople or the seemingly gentler “Frequently Asked Questions” have no legal standing. If it’s not in the Policy, it’s not part of the agreement. Licenses are legal documents. You don’t sign legal documents based on casual pleasantries. If a landlord says you can move out at any time, but the lease says you have to give notice and pay rent until a new tennant is found, trust the lease or make the landlord change it. 3. The Policy is illegitimately retroactive. The Policy limits the use and transfer of all records, not just new ones. The diligent catalogers of forty years ago who thought that OCLC was a humble cooperative helping libraries copy catalog had no idea that they were laying the foundations of a data monopoly. Retroactive licenses are legally dubious and morally obnoxious. If OCLC wants to impose a new license, it should not do so on legacy data. 4. The Policy is perpetual and will create a perpetual monopoly. Most licenses lay out what does and does not “survive” termination. Not here. There is no out from the Policy whatsoever. You can leave OCLC and sit on your records for twenty years and they still effectively own them, and they can still strip your library of them at any time. The policy lasts forever, on every record it touches and no matter who touches it. The perpetual nature of the agreement means that, once this policy goes into effect, it’s all over. The vast majority of the world’s library data is owned and restricted. What US library could even think of exempting themelves of every “OCLC-derived” record? The “network effect” is just too great. Unless OCLC changes its mind or dies, there will be no second chance. 5. OCLC can change the Policy at any time, in any way. As the Policy states, “OCLC may issue a modified version of this Policy or a substitute for this Policy at any time.” There is no check whatsoever on what this new policy can require or prohibit. Given the lack of member input that characterized its introduction, OCLC members may confidently expect to have no role in any future changes or “substitions” either. A perpetual license that can be changed at any time is a lot of power to any institution. Does OCLC deserve that sort of power? 6. If you violate the policy your library automatically loses the right to any “OCLC-derived” records you have. Imagine losing all the OCLC-derived records in your library catalog. Imagine turning all your automated systems off until every bibliographic and authority record that passed through OCLC at any point was identified and removed from your library, and new “untained” ones found or created from scratch. What library in the United States could keep its doors open if it lost the right to use “OCLC-derived” records? It sounds dire, but according to the Policy, if you violate the Policy in “any” way, OCLC can shut down your library. 7. OCLC has sole discretion to declare a library in violation and strip it of its records. If someone handed a government agency the power to kill libraries, and do so with no appeal or legal recourse, librarians would be in the streets in protest. 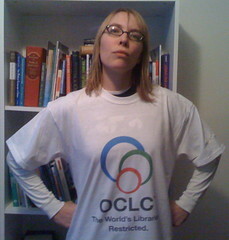 Why does OCLC get a pass? Visit and link to the Code4Lib page on OCLC Policy change. Sign the Internet Archive/Open Library petition to stop the OCLC Policy. Sign librarian Elaine Sanchez’s petition. UPDATE: Note that it’s Friday, January 16. See the page. *I am dying to be there, but I simply can’t make it. One way or another, however, we’ll try to get our word out. Would like some garlic fingers? BTW: Can you guess what this is advertising? 3. Who can forget If Amazon sucked like our old OPAC? 4. Someone should do a joke pomegranate-like OPAC video. It would start out with standard features, then add Web 2.0 features, like tagging, then searching everything every printed, then searching all TV shows, including never-aired episodes, then searching all conversations in Starbucks, Panera Bread and Roy Rogers, then searching all thoughts that took place within a meter of an iPhone, etc.